In a surprising bit of news, Assamese TV serial ‘Jibonor Chaknoyar..’ scooped up a bronze statuette from the annual TELLY AWARDS, which is held in Kentucky in USA, making the state proud by becoming the first serial from Assam to achieve such a feet. The serial with English subtitles, produced by London-based Dr Ranen Sarma under the banner of Rondeep Production, received this award in the ‘People’s Choice’ category. It was selected from well over 1300 applicants after it was thoroughly reviewed by a selection panel, comprising of professionals from the film and television industry. The serial must be of a certain quality and standard to be considered for selection to the awards. In a very rare instance for the Assamese entertainment industry, the serial has used the Drone camera to take aerial shots for the dance sequences. Interestingly, the award is from the same company that also manufactures the famous Oscar statuettes. It’s Rondeep Production’s second project after the feature film ‘Ahir Bhairav’ to receive an international award. ‘Ahir..’, directed by Siva Prasad Thakur, won awards at the New York Independent International Film Festival. Directed by Munna Ahmed, ‘Jibonor Chaknoyar..’s script is written by Prabhat Goswami from a concept and story by Dr Ranen Sarma. 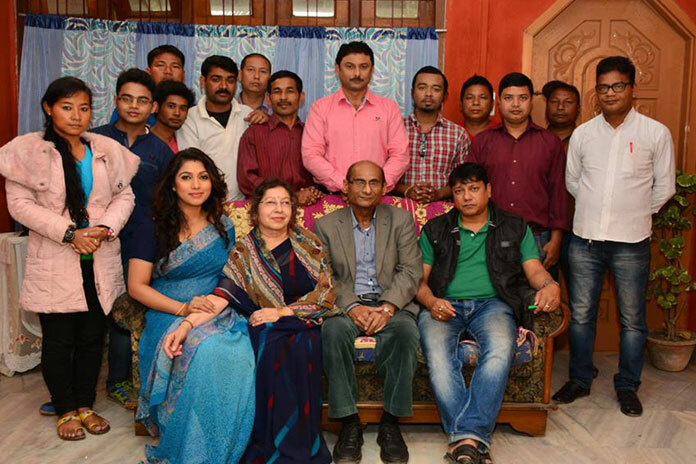 The serial starred artistes like Pradeep Nischith, Diganta Baruah, Madhusmita Borkotoky (Choudhury), Piku Sarma, Barsharani Bishaya, Preetisha Goswami, Papari Kalita, Pompi Deka, Priyanka Bhargav, Rubi Mahanta, Niharika Goswami, June Saikia, Swapna Goswami, Pragya Parimita, Nargis Hasnat, Debajit Senapaty, Suren Bora, Utpal Nandi, Prasanta Goswami, Pallab Borah, Jeffry Bakshi etc. The serial’s camerawork is done by Pijush Choudhury. Both ‘Ahir Bhairav’ and ‘Jibonor Chaknoyar..’ are drawing in plenty of viewers on YouTube and the official web portal of Rondeep Production – www.rondeep-productions.com. Meanwhile, Rondeep Production is busy recording a new album in Kolkata entitled ‘Shraddhanjali’ featuring 19 Bongeets and Goalparia folk songs, being rendered by several well-known Assamese artistes scattered in various parts of the country. The traditional indigenous music has never been of much interest to the urban populace who has grown up with Bollywood and other popular forms of music. Rondeep Production is endeavouring to change this outlook by reviving interest and strengthening people’s engagement with traditional music. Its founder, noted cultural activist and physician Dr Ranen Sarma is doing his bit to preserve, promote and propagate Assamese traditional songs and tunes among the twenty-first century young generation. He has made an effort here to reach out to the public, especially the young generation. He has also ensured that the songs in this new album are rendered without detracting from the purity and integrity of traditional music. All the songs – 10 Bongeets and 9 Goalparia Lokageets in ‘Shraddhanjali’ are rendered in their original tune and accent. This rare album celebrates our rich and vibrant culture, heritage and tradition. Dr Sarma had previously produced the much admired audio-video album in Assamese ‘A Collection of Nazrul Geeti and Rabindra Sangeet’. Rondeep Production is planning to release ‘Shraddhanjali’ next year before April 15.